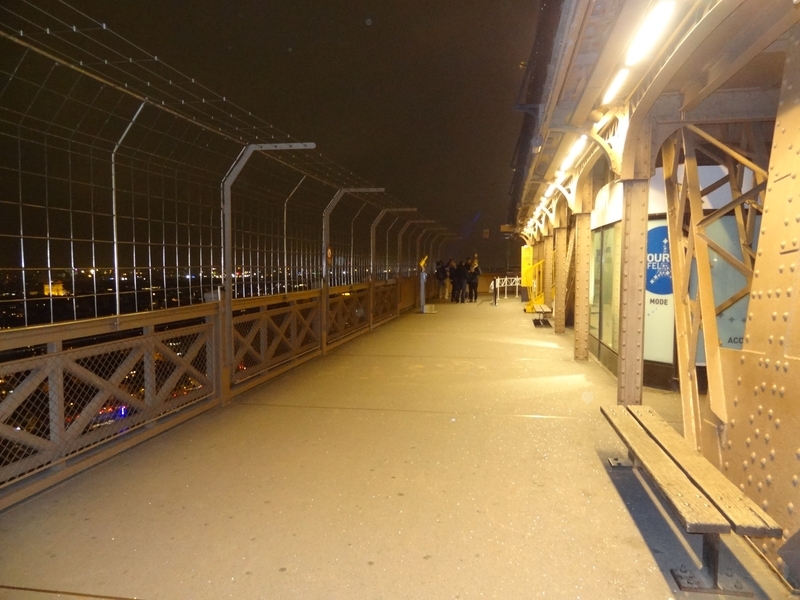 The 2nd floor of the Eiffel Tower is perhaps the least interesting of the three. It has not been renovated recently, so its style inherited the XIXth century is old, while the same style at 3rd floor does not do it. It may be a question of the size of the floor that does that, but the first floor, which was renovated in 2011 is much more modern, more interesting too. The second floor is also the most commercial, this is where most shops are. Like the 3rd floor, it is on 2 levels, with several stairs that allow you to go from one to the other. This floor is 115m from the ground, there are 674 steps to get there on foot. It measures 1430 m2, for sides of 37.80m long. It's very simple, you have two solutions: On foot or in elevator. In this 2nd case you will have the choice between the west or east elevator, which does not matter, they are the same, except the color. But it's not really a relevant argument for choice. To go on foot has its advantages, more than one thinks. First, it allows to better apprehend the monument that we discover from the inside. The higher you climb, the better you can see the entanglement of beams and spacers. The Eiffel Tower indulges in its intimacy to visitors walking on foot, much more than in an elevator. We also discover details such as the sodium lamps that serve to illuminate the night, and also the detail of the parts that compose it. It is by walking next to the rivets that we have an idea of ​​how it was built. One can also cross the race of the lifts and judge their climbs. Finally we must highlight the pleasure of arriving at a floor by the stairs, since we "emerged" from the ground instead of foolishly leaving an elevator shaft. But it still has its disadvantages: it tired! On this subject you have a study that was done at the beginning of the 20th century on the physiological effects felt when going up to the 3rd floor by the staircase (which is impossible nowadays, it is closed) It is amusing, if not really instructive. Joke aside, the climb is still long, especially for the 2nd floor, so it's only to do if you're in good shape, and if you agree to take your time. It is of course to be discouraged for all those who have marathons days in Paris, visiting 4 monuments in the day: They will not hold the climb! Riding through the elevators also has advantages, starting with not getting tired. 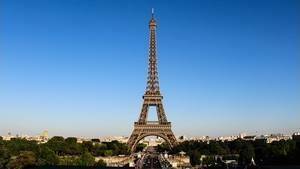 It also allows you to discover Paris by climbing quickly, which is always fun. It also makes it possible to see the elevator shaft and in particular the rails with variable inclination. But the real interest is to see the 3 tanks-counterweight, two of which are still used, which rise and fall from their supports to the rhythm of the elevation of the cabins. One of the drawbacks is having to go up to the 2nd floor without being able to stop at the first, the cabin stopping, but the doors not opening. It is voluntary, probably to smooth the flow of visitors. And honestly, it is rather good to get as many people up to discover the tower down, it is better to discover it by going up gradually. Whether by stairs or by elevator, you will arrive on the 2nd floor. If it is by elevator, it will be at the upper level, for the stairs, it will be at the bottom. At each corner the sloping pillars cross the floor in a tangle of beams, and in the center there is a kind of courtyard sheltering the elevators for the third floor. If you think it's a courtyard, it's actually a passage under a room above the level, which is the room of the restaurant "Le Jules Verne", gourmet restaurant run by Alain Ducasse. It is accessed by a private elevator that goes directly into the restaurant room, restaurant with a staircase also. It is under this staircase that we pass to access the cabins for the 3rd floor. Apart from that the upper level still contains a shop, several machines to get a "special Eiffel Tower", ... and that's it. 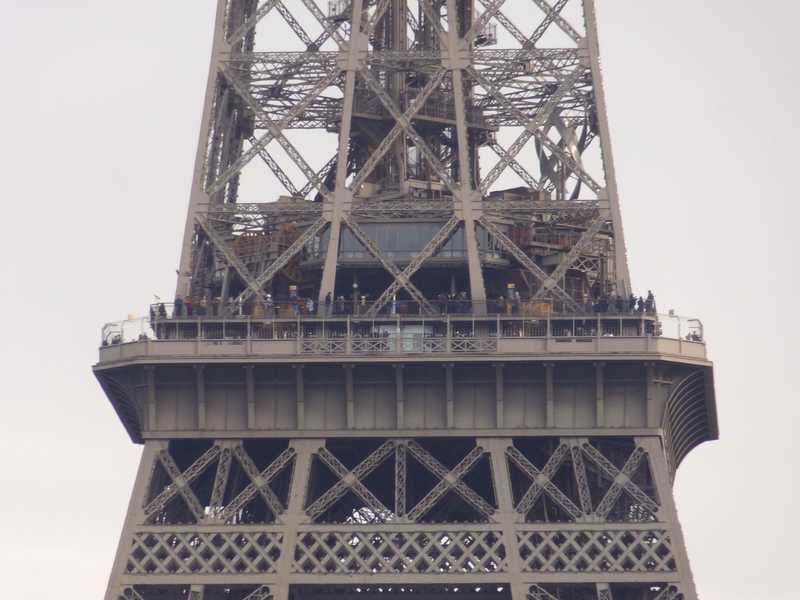 The rest is more to discover the entrails of the tower than anything else, because here is the right level to observe how the beams of the tower are linked. We can see very well the mechanical parts of the lifts, the jointing of the 4 pillars in one, the spacers, the sodium lamps illuminating the structure, the night, etc. One of the interests anyway is the view. When we are at the edge of the platform we dominate the lower gallery, the one with a large thick fence serving as guardrails. From the upper level, we do not have it, the view is clear and panoramic. Lower than the 3rd, the details of the military school, a few hundred meters away, and those of the nearby monuments, such as the Arc de Triomphe, are fairly well distinguished. Know that even if it is not very beautiful the view is interesting, we still see everything around. It's just the distant view that becomes blurry, even invisible. The lower level is a little more interesting than the other, but it's still not the best thing to see on the Eiffel Tower. Be that as it may, this level is larger than the platform above, it contains in addition 4 large galleries of a style peculiar to the industrial revolution. From these galleries visitors can enter under the platform, it is a very large room, not very high ceiling, which gives an impression of suffocation, especially when there is a large affluence. This room is very crowded, it is articulated around a round shop, quite large, whose external decoration is a representation of the view of the 2nd floor on Paris. It's really pretty and successful. By turning around this shop we will find two other shops, a snack bar, a macaroons bar (and yes! ), Souvenir machines, etc. 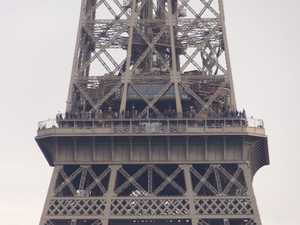 Very wide (they are the widest of the tower, 4m) they are dotted with benches very useful for resting and long-sighted for the curious wanting to discover Paris. The interest here is only to walk around reaggling Paris. While there is a big thick fence, but finally it is easily forgotten, it does not really disturb the view. This floor is perhaps the most interesting to see Paris from high, it is one where the view is the most clear without the loss of detail due to the height. We can also notice the beauty of the architecture of the galleries, they are in the style of the nineteenth century, very technological. Streetlights light up slightly at night, they recall the gas jets that were in place, initially. Note that the ground is inlaid with the 4 cardinal points at the corners. Before going on to describe each visitable item on this floor, here is the text written by Gustave Eiffel in 1900 describing the 2nd floor of his tower. It is not really valid today, except in the general dimensions that have not changed. The platform of the 2nd floor is located at 149.23 (board XIX, fig 2 and 7). It forms a square whose measured side outside the gutter is 37.90 m and whose perimeter is occupied by a gallery of 36.80 m by 2.10 m wide, plus by two gutters of 0.55 m. The surface, taking into account shot angles, is 1433m2. This gallery is represented in the board XIII-bis, fig. 93 and 94. For the evacuation of rainwater, the gutter, which surrounds the entire belt of the 2nd floor, receives the waters of the platform and the gallery. From there they go to the two pipes of the inner rafters of the East and West piles, and will join those of the 1st floor. Layout. This platform was very crowded during the Exhibition and there was strictly speaking only the external gallery which was used for the visitors, to examine the interesting panorama which is already discovered at this height. The rest was almost entirely dedicated to traffic between the Otis elevators and the Edoux elevator. 6. Finally the departure of the spiral staircase that connects the second platform to the upper floors. 2. A bar assigned to the Viennese bakery and held by Mr. Jacquet. Both pavilions were installed by the dealers and at their expense. 3. A building between one of the tanks and the Edoux elevator, in which were installed the ticket offices and water-closets. There were also a few shops and bars, and finally tents for the consumers. A 6-meter freshwater tank, powered by the small Worthington pump, discussed earlier, was used to service the restaurant, bars and water closets. The lighting was originally done with gas by 750 l fire pots and spouts in globes. Since then, electricity has been used exclusively. Il existait en outre quelques boutiques et bars, et enfin des tentes-abris pour les consommateurs. Un réservoir d'eau douce de 6 m , alimenté par la petite pompe Worthington, dont il a déjà été question, était affecté au service du restaurant, des bars et des water-closets. L'éclairage se faisait primitivement au gaz par des pots à feu de 750 l et des becs dans des globes. Depuis, on a employé exclusivement l'électricité. 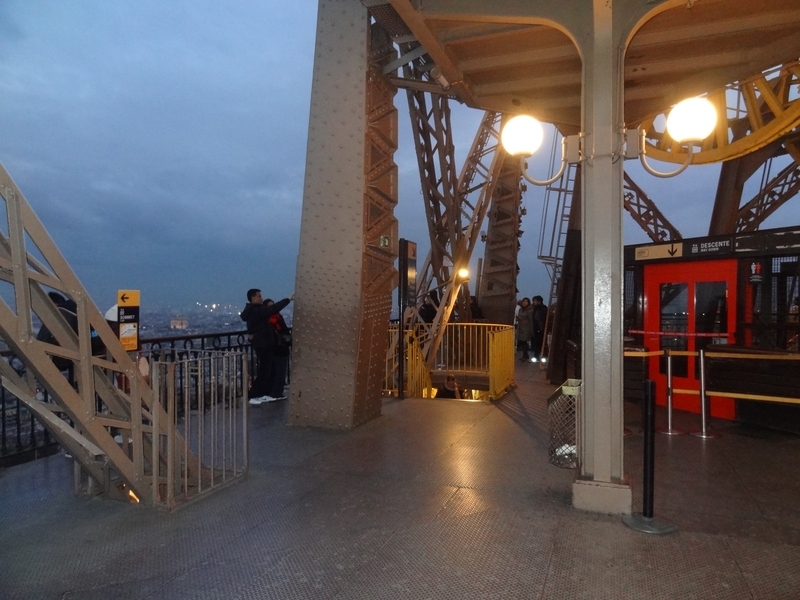 What is there to see on the 2nd floor of the Eiffel Tower? This is one of the curiosities of this floor, it has a bar with macaroons. It is actually a small shop of about ten square meters, almost entirely glazed, which gives both on the galleries and inside. At opening hours we sell ... macaroons. There are of course all kinds, all perfumes. The boxes are pretty, stamped with the logo of the Eiffel Tower. There is in the window, behind the seller or in the room, particular compositions whose most beautiful is probably a reproduction of the Eiffel Tower, a good meter high, but there are others, just as impressive. The main hall occupies most of the lower level of the 2nd floor. Modest height for its size, it is very busy with many kiosks. There are no less than 4 shops, plus a snack-style restaurant, and the famous macaroons bar. The floor also has a toilet, of course. This room revolves around the central shop, of rounded form. The main feature is the decor of this shop, completely covered with a sticker representing the view of the 2nd floor of the Eiffel Tower. As the shop has only one opening, we have the view of almost 360 °. Otherwise there is not much to do here, except to shelter from bad weather or shopping. There is also the inevitable machine to buy a souvenir piece. This room has a pretty floor, but a little dated nowadays. Similarly, its ceiling, rather low for such a room, is also dated. Nothing extraordinary on the galleries of the 2nd floor, but they are very broad and thus allow to walk in all tranquility, even by strong affluence. In addition, here, the perimeter is 150m long, you will always find a place to contemplate the view. The style of the galleries is the same as that of the tower, very technological, but it must be said that it is successful. There are regular benches, and spotting scopes. This point of view is probably the prettiest there is on the Eiffel Tower, neither too high nor too low. Only the upper level allows to have an identical view, but without the safety screens that can affect the view.